Chinese black vinegar: Similar to balsamic and perfect as the base for a dumpling dipping sauce. Hot sesame oil: Adds a spicy kick to soups, stir-fries, and salad dressings. Brown rice cakes: These sliced rice cakes have a texture similar to a flattened piece of gnocchi and they’re a great (and gluten-free) alternative to pasta. 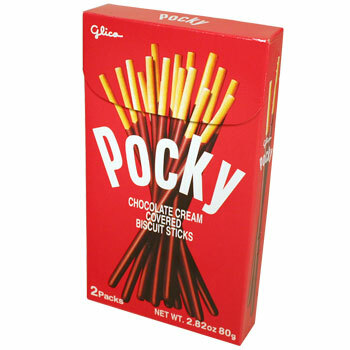 Pocky sticks: Chocolate-dipped biscuits that are a (relatively) low-calorie, sweet indulgence. Dried mushrooms: Soak in lukewarm water for about ten minutes, drain and squeeze, and chop up for stir-fries, soups, or fried rice. Yu-Choy: If mustard greens and broccoli rabe had a baby…it would be this. Fried shallots: Works on everything—basically, a skinnier, less puffy version of French’s fried onions. Oyster sauce: Adds a salty, earthy depth of flavor to sauces. Fish sauce: Go for the Three-Crabs brand, perfect in Thai-style salads. I don't even know where I'd begin if I had to make a list. 0 Response to "Leah Mennies' Asian Supermarket Picks"